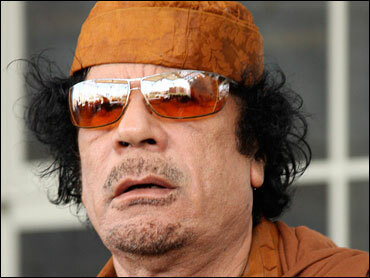 Libyan leader Moammar Gadhafi, in Rome to attend a U.N. summit on world hunger, has hosted a soiree with some 200 young Italian women and tried to persuade them to convert to Islam. A reporter for Italy's ANSA news agency went undercover with the women, who were hired for euro50 ($75) by a modeling agency for the event Sunday evening. Journalist Paola Lo Mele said the women assembled at a hotel, where some where left behind because they were not tall enough or dressed modestly enough. Those accepted were taken to a Rome villa, where Gadhafi lectured them on women's rights and religion, and urged them to convert to Islam. Lo Mele took pictures before and after the event, showing the women carrying Qurans they received as gifts.